This Article/Review includes a section about Installation later in the article. The Fluidized Sand Bed Filter is not a new concept, in fact my maintenance friends have been using these back to 1995 and even then admittedly we were far from the first to utilize the benefits of these awesome aerobic and even anaerobic bio filters. The most common usage is for planted aquariums, some marine aquariums, high bio load aquariums (such as “feeder fish” in aquarium stores), or as an alternative to some canister filters. Fluidized Bed Filters use fine sand kept suspended in a water flow for aerobic biological filtration. The plus is they are basically self cleaning as the sand is constantly rubbing against other grains keeping down the organic buildup. Widespread use has been somewhat allusive, moreover, part of this is based misinformation or misunderstandings by many websites, forums, and blogs [even otherwise excellent ones]. One example of an excellent usage is for marine use, as a friend of mine set an entire marine department with these filters as the PRIMARY bio filter! The difference is he also utilized deep sand beds, live rock and protein skimmers along with taller versions of Fluidized Sand Bed Filters to allow for anaerobic de-nitrification as well as aerobic nitrification. A newer innovation that really has improved upon the use of quality fluidised aquarium filters (in this case primarily marine use) is NPX Bioplastics Nitrate & Phosphate Reducing Polymer Media. This product is VERY efficient when used in a fluidized filter at controlling nitrates and phosphates (the TMC model is much easier to use this in I might add). With this product, use of a Fluidized Filter in a marine reef aquarium has no boundaries at all along with already proven results in freshwater, especially planted freshwater aquariums. Even without the use of NPX BioPlastics, a taller FSB Filter such as the TMC model #1500 or even #1000 can perform some de-nitrification, or in other words, nitrate removal. It is also noteworthy that improvements with this filter concept have been forthcoming over the years since the first models that were great in concept, but poor in design. Unfortunately though, many spam websites such as About.com do not even list the latest generation Fluidized filters, but then my observations and those of my friends that have been in the aquarium industry for decades have seen little value to anything About.com publishes. As an example, their article about aquarium planaria, as the information contained there in is so extremely scientifically inaccurate. Please Reference: Aquarium Planaria or Detritus Worms? When properly constructed and functioning as they should (correct suspension of sand in an even churning motion), the Fluidized Filter has bio capacities unsurpassed by ANY other type of aquarium or pond filter. To the point, the newest generation TMC V2 #600F Fluidized Filter has the bio capacity of 35 pounds of fish or other bio life, and this is the smallest model of this current generation of Fluidized Filters. The larger model #1500F can easily surpass the overly hyped Fluval FX5/FX6 or Ehiem 2080 in pure nitrifying bio capacity [as can the smaller models]. For marine reef aquariums, when used with oolitic sand with some form of mechanical filtration, live rock, a Protein Skimmer, these can often replace many more elaborate filtration systems and reactors. The before mentioned friend replaced his fishroom with these filtrs and found lower nitrates, more stable alkalinity and calcium levels (using oolitic sand). The fact these filters are not utilized more by marine and planted aquarium keepers does not speak well for how we pass information of late in this hobby. While the new generation Fluidized filters generally cannot perform chemical filtration and only limited mechanical filtration; when compared “apples to apples” the use of these Fluidized Filters instead of the high priced and often over hyped Fluval FX5 or FX6 or Eheim 2062 /2080 should be a ‘no brainer’, especially when cost is factored in. This said, a second filter whether a Canister, HOB, Internal, etc. that can perform these other functions AND for REDUNDANCY should be paired with a Fluidized Filter [if only as an excellent pre-filter for your Fluidised sand bed filter]. As a generalization, ANY aquarium should be set up this way with at least two filters if only for redundancy as per most aquarium professionals consulted for this article. However many users have added products to the fluidizing chamber that can affect other aspects of aquarium filtration such as NPX Bioplastics for phosphate and nitrate removal. 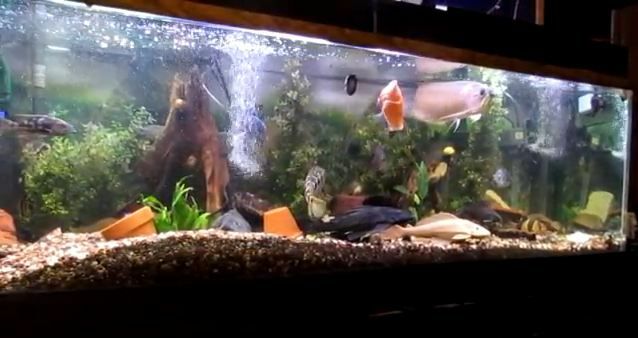 For high bio load aquariums such as “monster fish tanks” with fish such as Arowana, Oscars, etc, the FSB Filter is a “Godsend” when it comes to handling this high organic load. The picture below is from a friend’s client 220 gallon tank that uses a TMC FSB Filter Model 1500 as its primary bio filter. This particular filter has a capacity of 30 lbs of fish, etc.!! 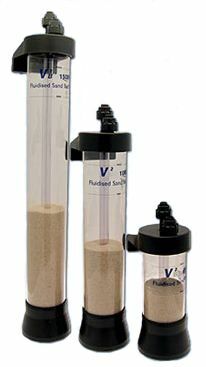 Fluidized Sand Bed Aquarium Filters are not self powered but works well attached to an internal filter, power head/water pump (such as the SunSun HJ 1542), or canister filer. A Fluidised Sand Bed Filter also needs water to be pre-filted to remove large particulates taht can clog the filter and cause the fluidation process to be inefficient or stop completely. 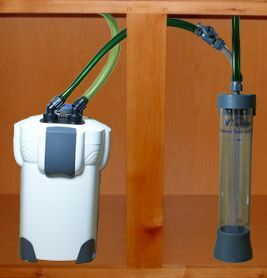 With the power head/water pumps, the FSB filter can be placed under an aquarium, on the back, in a sump, or even in the aquarium for some models such as the TMC V2 FSB filter. My personal preference is the use with a power head pump such as the Rio Plus 1000, 1100, or 1700 along with a Filter Max #3 [or #2 for lower flow applications]. For tanks with large amount of organic debris in the water column, the Hydro Pond #3 or #4 attached to your power head/water pump would be a good choice. With this method versus the popular canister filter application you add redundancy if you already have a canister filter, or better if you do not have a canister filter, you free yourself from these often troublesome filter monstrosities [I know of friends in the aquarium service business who claim they get more service calls and complaints about canister filters, regardless of brand than ANY other filter type]. With the addition of a Sponge Pre-Filter, this allows for removal of debris that could potentially lower the efficiency or clog your Fluidized filter and also simply allow for added mechanical filtration that would bring many Fluidized filters to a level of bio filtration no canister filter could match! “Later we utilized the LifeGuard (Pentair) Fluidized Filters, which were a big step forward in efficiency and reliability. “In fact in tests utilizing several different canister filters such as the Via Aqua 750 (& later the similar SunSun Models), Rena Filstar 2, and Magnum, wet/dry & large canister filter only systems, which included the Ocean Clear (converted to Bio Balls, Ceramic Media) and large Eheim Filters. The measured results showed the Fluidized Filter Systems out performed all these before mentioned filter systems by a very large margin. Now, fast forward to 2011 and the 3rd generation TMC Fluidized Filter Systems; these fluidized filters have less issues with blockage or “kicking out” sand and simply put work much more reliably than the Pentair (LifeGuard) 2nd generation Fluidized Sand Filters. The occasional leakage problems of the Lifeguard FBF are much less common with the TMC FBF. 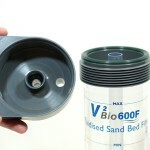 Although actual bio filtration results are not notably better, the ease of use, versatility, and reliability make the TMC V2 Fluidized Sand Bed Filter the better choice in our experience and why this is my fluid filter of choice. One MAJOR ADVANTAGE over the Lifeguard filters is the ease or the large screw off top versus opening a small valve assembly on the Lifeguard to service and add media which then requires a funnel. Because of this, adding sand media and servicing is vastly easier with the TMC FSB. 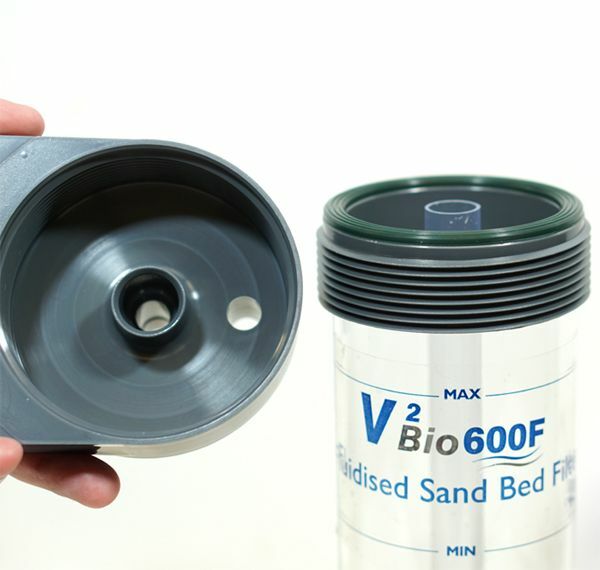 One example of versatility is the TMC V2 Fluidised Filter has a much more simple method of adding sand, or media such as NPX Bioplastics versus the small opening with the LifeGuard/Pentair models which are much more difficult to add additional media through. The TMC V2 does not have as much incidence of back up as earlier models either, especially the Sea Storm and Merlin. Sand back up is not as much problem with the 2nd generation Lifeguard Fluidized Filters (the design is still not as secure to prevent this as the TMC model), although the Lifeguard still had/has issues of poor fluidation and sand loss often due to “uneven fluidation”. Of most importance, especially with a “monster fish tank” that likely has a large amount of organic debris in the water column is pre-filtration. Whether you run a canister filter that contain filter pads, sponges, etc to filter out this large debris or add a sponge pre-filter to your water pump; the use of GOOD pre-filtration is a MUST, regardless of brand [although some brands such as the Pentair clog more easily than others]. 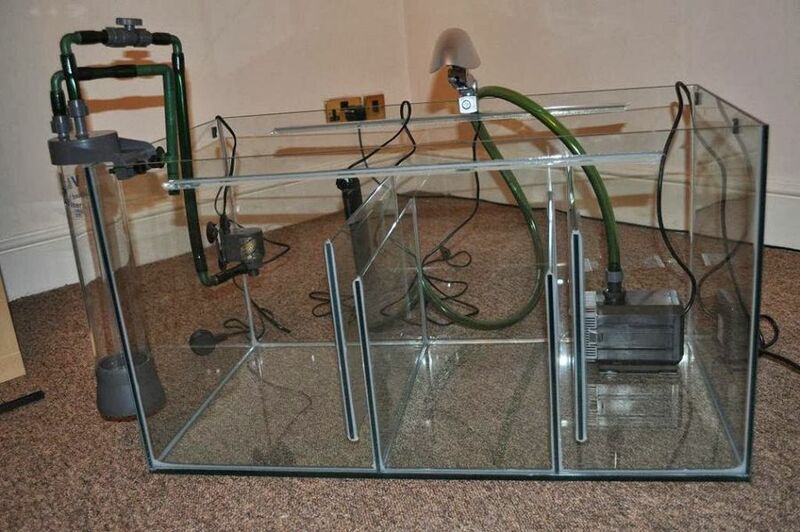 As I noted earlier, the Hydro Pond Filters will likely do the best job of pre-filtration for high organic load/debris aquariums, but other methods can be employed such as making an acrylic box, adding holes, then lining with aquarium safe sponge material or coarse poly pads to protect the water pump. Using sheet rock or similar to hide your water pump in then back filling with pebbles or better, volcanic rock, can provide excellent pre-filtration. What is worthy of note is that a water pump that has a lot of organic debris on the impeller or in the impeller well is a sign of poor pre-filtration and likely current or future poor performance of the fluidised sand bed filter. A second note of importance is that most FSB Filters have a minimum and maximum sand fluidation line, this is the area where the filter is most efficient. While being closer to the high/maximum line will yield your best results, it is not nearly as important as reaching the minimum line, so simply adjusting your FSB filter within these two lines is most important. Next, a salient point is that your sand is going to be light initially, but as bacteria builds on the sand, it will become heavy and your fluidation level will drop. This is nothing to worry about as long as it is above the minimum line, but if your adjustment valve is partly closed, you can can open it some more to increase the flow (assuming your pump has enough head pressure). This brings me to the next point (which I will expand on with pictures and further information below), that is pump selection. 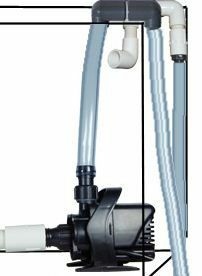 Make sure your flow rate is within the FSB Filter manufactures suggested minimum gph (& lph) within 1/4 of the pump or filters rated maximum head pressure. In other words a FSB Filter with a 210 gph suggested flow rated should use a pump that is rated at 210 gph or higher and a pump with a maximum rated head pressure of 6 feet and this same 210 gph flow rate should not be placed more than 1.5 feet below the water level. This first picture to the left displays four different methods of power head installation, all utilizing a Sponge Pre-Filter, built-in sponge, or Hydro Pond Filter to “run” your Fluidized Sand Bed Filter. *Rio Plus 1000 with a Filter Max #2. 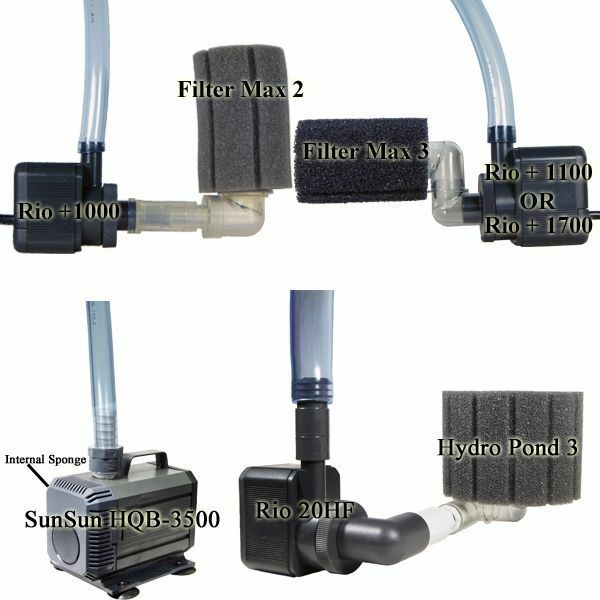 *Rio 20 HF with a Hydro-Pond #3 (either a Hydro-Pond #3 or #4 can be substituted for a Filter Max where a high aquarium or pond bio load requires a larger pre-filter). A TMC V2 #1500 Fluidized Filter teamed up with the Hydro-Pond #4 would provide top notch bio filtration from both the large capacity Hydro Pond #4 as well as very good medium to coarse mechanical filtration that NO CANISTER filter including the Fluval FX5 can even approach (regardless of water pump used whether the Rio 1700, or any other water pump). As a side note, commentary, I prefer the TMC #1000 & #1500 over the model #600, even for smaller aquariums, as the #600 does not have a tall enough “reaction” chamber to fully fluidize the sand bed. With some ingenuity, one can add Purigen, Carbon, or whatever other chemical filtration media by adding to the inside of the Hydro-Pond Sponge. Add the NPX Bioplastics to the Fluidised Filter and for a Marine tank with a Protein Skimmer and you have a first rate high capacity filter system that can easily handle a 200 gallon aquarium. With a freshwater aquarium, the use of the Bioplastics inside the Fluidised filter require the use of Purigen as well to remove the bio wastes that a Marine Protein Skimmer normally would in a saltwater/reef aquarium. IMPORTANT: Do not anything other than the required sand, rock, or ceramic media that comes with the Fluidised filter along with the Bioplastics as an option. Carbon and in particular Purigen will not work properly in the reaction chamber of a FSB filter and such products should be placed in another separate filter or placed next to the intake of a water pump or sponge filter. The first picture to the left displays the use of an Intake Adapter and a Return Adapter that can be a simple DIY part or purchased. These can be helpful for some Fluidized Filter applications with a power head in the aquarium while the Fluidized filters sits below the aquarium rather on the back. Please note that the TMC V2 Fluidized Bed Filter already includes their version of an intake adapter, however the V2 FB Filter only includes a simple return, so this return adapter pictured here provide better water control than part included. This picture displays a TMC FSB Filter as per a of a sump system. In this case, the aquarium owner is running the FSB filter off from a separate pump than is running the main sump system, which is suggested. However I personally would recommend a pump with a pre-filter. Another effective bio filter is the Sponge Filter, especially the Patented Hydro Sponge Filter. A Fluidized Filter can be used with either a canister filter or power head, however CO2 injection cannot be used in-line with the Fluidized filter. Aquarium filters are critical components of both freshwater and marine aquaria. Aquarium filters remove physical and soluble chemical waste products from aquaria, simplifying maintenance. Furthermore, aquarium filters are necessary to support life as aquaria are relatively small, closed volumes of water compared to the natural environment of most fish. The picture of the 220 used in this article belongs to me, If you would like updated pictures please let me know. – Find me on Facebook. I am setting up a 220 g reef tank. There will also be 2 60g frag tanks on the same system, and along with the sump, fuge, etc, it should be a total of about a 450 g system. I will utilize Berlin w/ a macroalgae refugium, protein skimming, and UV. I was thinking of adding a second filtration system on the other return and I have been fascinated with FSB reactors. As you point out in your article, there is a lot of misinformation out there on these systems spouted by people who have never run a FSB and it seems like you have real experience using one. What are your thoughts of adding an FSB to what I outlined. 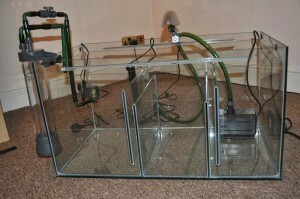 I would like to pack my DT full of inverts and fish, as well as support a couple of good sized fragging tanks.